Finding out that Wanda Jackson released a version of "Candy Man" on 45 was just about the best thing to ever happen to my country DJ life. One of my favorite singers doing one of my favorite songs?! It's a dream come true. Today Wanda Jackson turns 77! I met her briefly when a bunch of us brought her to Olympia to play Ladyfest 2005. I will say, she seemed a little detached from the situation, but I guess I can hardly blame her. And really, who cares?! It's WANDA friggin' JACKSON! I shook the hand of Wanda Jackson, "THE First Lady of Rock 'n' Roll"! Well, it was more like she put out her hand and I touched it, and she seemed a bit put off by it. But whatever. It happened. Surely some of her magic must have rubbed off on me a little bit. I think her legacy can be summed up in what I witnessed during my visit to the Country Music Hall of fame last year. 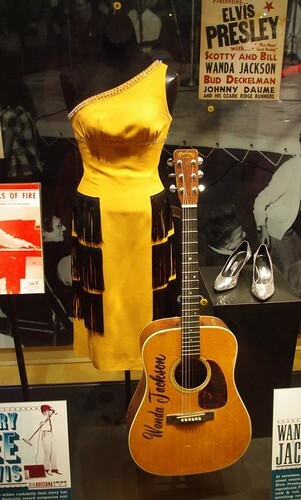 The museum was packed with artifacts from dozens and dozens of country music legends from Johnny Cash to Taylor Swift. What artifact attracted the most enthusiasm? WANDA JACKSON'S GUITAR! People were huddled all around and standing in line, waiting to marvel at it and take a photo with it. There was a video of her performing "Hard Headed Woman" playing above it. From behind me I could hear an older couple reacting to the video. The man said to his wife with a chuckle, "She was a REAL wildcat, wasn't she?!" Yes, sir. Yes, sir she was!